Can truth be found in a film in the current era of "fake news?" The Dallas Museum of Art explores that question with Truth: 24 frames per second, its first major exhibition dedicated to time-based media. On view through January 28, the exhibition features 24 pioneers of film and video, spanning six decades. French film director Jean-Luc Godard’s quote "cinema is truth 24 frames per second" inspired the exhibition’s name and acts as a challenge for visitors attempting to define truth and reality. 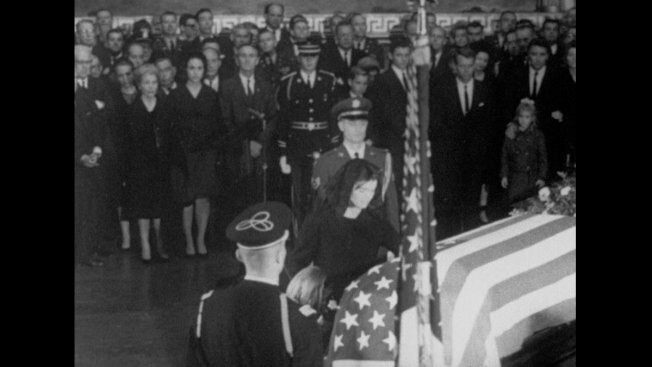 The exhibition begins with the world premiere of a newly restored version of Bruce Conner’s "Report," a film exploring the assassination of President John F. Kennedy. The tumultuous montage of found footage puts actual coverage of the event in context with the popular mythology of the nation’s 35th president. From this exploration of a historical event, the first half of the exhibition presents film artists’ interest in contemporary political and social issues. Coco Fusco and Paula Heredia’s 1993 "The Couple in the Cage" is a satirical exploration of Western culture’s curiosity of the exotic Other while Dara Birnbaum’s multi-screen installation "Tiananmen Square: Break-In Transmission" illuminates a significant moment in television history. Willie Doherty’s "Ghost Story" is a haunting 15-minute film, created in Derry, Northern Ireland. Phantoms of Ireland’s Troubles stalk the present-day, undermining the appearance of tranquility. Scaffolding welcomes visitors to the second half of the exhibition. Anne Tallentire’s "Drift: diagram xvii" uses small screens hanging from scaffolding to portray average London workers doing unglamorous work. "What I was interested in was the phenomenon of hidden labor. The city is supported infrastructurally by people who very often work in the margins. These clips are glimpses of those people much as you would see them walking down the street, catching them out of the corner of your eye," Tallentire said. Ben Rivers’ "This is My Land" also explores people who are unseen. Rivers documented the existence of Jake, a man who decided to live a self-sufficient lifestyle. "I was on a quest to find people who decided to live off-the-grid," Rivers said as he described earning Jake’s trust. "I spent time with him. A lot of it was just hanging out, chopping wood, drinking, talking and then I always had my camera ready. We just had a kind of exchange going." 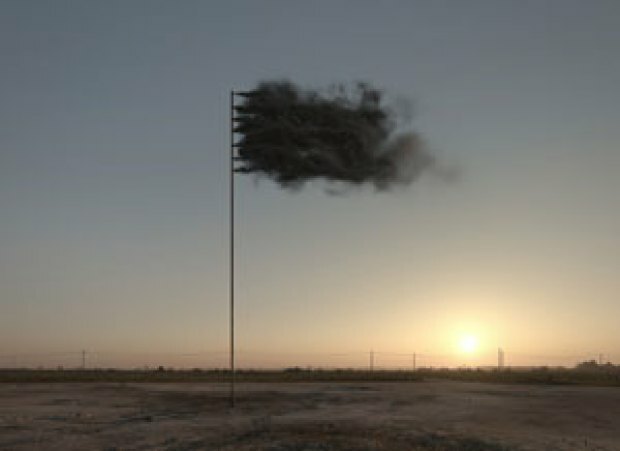 The United Kingdom’s Channel 4 commissioned John Gerrard’s "Western Flag" as a television intervention. On April 21, 2017, the piece would randomly appear on-air for 20 seconds to intrigue passive audiences. Gerrard makes it clear what this piece is not. "It’s not a film. It was never created. It’s a piece of software that’s producing this world 80 times a second for you to consume as consumers of art and culture," Gerrard said. "Western Flag" is a depiction of Spindletop, the salt dome oil field in Beaumont, Texas. When the well struck oil in 1901, the gusher blew 100,000 barrels of oil a day for nine days. "I think of Spindletop as not only the birth of the modern oil industry, but also the birth of modernity itself because much of what happened post-1901 is what we consider to be current," Gerrard said. "I wanted to create a visual symbol for carbon dioxide which is invisible, and my invention is a flag of smoke or a carbon flag." "5,000 Feet is the Best" by Omer Fast features the audio of an interview with a drone pilot precisely describing his work in Afghanistan. This clinical audio contrasts with the aerial view of a child riding a bike through a suburban American neighborhood. "A lot of it is about empathy, so how we can imagine that the drone victims are your neighbors in your suburban neighborhood," Anna Katherine Brodbeck, the Nancy and Tim Hanley Assistant Curator of Contemporary Art at the Dallas Museum of Art, said. The piece also presents the isolation and antipathy of the drone pilot as manifestation of modern warfare. One of the final pieces in the exhibition speaks to the fate of the image itself. 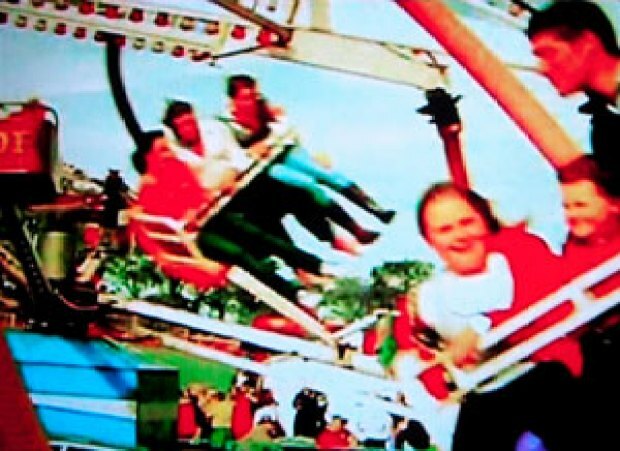 James Coleman’s "Untitled" depicts a fairground carousel with a reference to the slide projector central to Coleman’s work. "What this work is about is the death of the image as we have known it before. In the beginning of the 20th century, I take a photograph and the photograph captures reality. You keep it as a memento, as a true depiction of something you’ve seen or a family member and it stays with you. But in the digital age, that is over. It’s all about who can get the image first and who can manipulate it quickest," Gavin Delahunty, the Dallas Museum of Art’s former Hoffman Family Senior Curator of Contemporary Art, said. "The ability to capture reality has been eradicated." Kimberly Richard is a North Texan with a passion for the arts. She’s worked with Theatre Three, Inc. and interned for the English National Opera and Royal Shakespeare Company. She graduated from Austin College and currently lives in Garland with her very pampered cocker spaniel, Tessa.